Whether it’s to save money, eat healthier or to get more exercise, many of us are vowing – hoping – to do better next year. My number one New Year’s resolution? It’s not to make any New Year’s resolutions. Because after so many years, the repetition completely bores me. And the fact that they get repetitive is a pretty obvious sign that these resolutions went unfulfilled (again) last year. And yet. Without fail, around this time of year – no matter how hard I try to resist its pull – my mind swerves to take me on a different train of thought, with the usual pressing questions: What can I do better next year? What have I learned from this year that will keep me from making the same mistakes next year? What goals do I want to accomplish? I read somewhere that more than half of resolutions fail. I suppose the reason for that is that the resolutions are too broad, too unrealistic or somehow flawed. 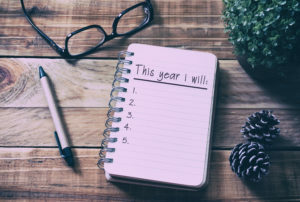 But setting resolutions is akin to setting intentions, which gives us all something to strive for and a reason to be optimistic (and we all need some optimism right about now; agreed?). Instead, it might be worth considering a more creative approach to resolution-making to ensure success. Set small, attainable goals. Rather than tell yourself you are going to lose 30 pounds next year, be much more specific and concrete. Set a goal of one pound per week. Similarly, don’t tell yourself you’re going to get back in shape; instead, commit to three days a week of exercising. Taking small steps also will help you realize that good health is an ongoing effort and process. Be realistic. If you’re not an organized person, no resolution is going to change that and the way your mind wants to operate. Besides, everyone has their own idea or organized and their own personal system and meaning of organization. Just because your desk is cluttered doesn’t mean you don’t know where everything is. But if organization is your resolution, try choosing one specific step you can follow- like telling yourself you’ll stop procrastinating or that you won’t just put things down, but instead you’ll give everything a home. This can often be enough to get a step closer to your goal. Make one change at a time. It can get overwhelming to think about all the things you want to change, and it can make you feel like a failure, as well. Just as behavior and habits take a long time to become ingrained, they can take a long time to untangle. Set a plan, but be flexible. Having a plan is the first step of most journeys, but as you probably know by now, life can get in the way. It can get frustrating when there are obstacles to your success, but as long as you realize that there will be obstacles, you’ll be more likely to accept them and not let them derail your plans. Have a back-up plan in your back pocket – just in case. Let’s all toast to goal-setting in a realistic, individualistic and optimistic way!